How and why we scour fabric that will be dyed with natural dyes, indigo, rust, contact printed, eco-printed, and more! When working with any mordant or dye powder always wear arespirator with fresh filters. NOTE: Any dyeing equipment used in natural dyeing, should never ever be used or reused for the preparation, storage or cooking of food or beverages. Scouring fabric is easy and will ensure excellent dye uptake every time. Scouring is a two step process, both steps must be followed if you wish to acquire the greatest depth of color. Scouring fabric removes the grease, dust, dirt and grime that fabrics encountered during the manufacturing process and transit. NOTE: Fabric softeners interfere with both natural and synthetic dye uptake. Using an large enamel or stainless steel pot, fill the pot at least half full and place one ounce of soda ash into the pot per pound of cotton or linen fabric/fiber. Place fabric into water, swish it around using a stainless steel spoon. Bring water to a boil!!! After two hours remove from heat source, allow fabric to cool down until the fabric is at room temperature. Remove the fabric from the water and rinse. NOTE: If the water is brown or grey replace the water & soda ash mixture with fresh water and soda ash and re-scour the fabric, it is not clean yet. repeat this process until the fabric rinses clean and the scour water is only mildly dirty. Your fabric is now ready to be Mordanted & Dyed! In this eBook I cover the basics of scouring, mordants, and soy milk preparation for cotton, linen, hemp, and other cellulose based fabrics.. 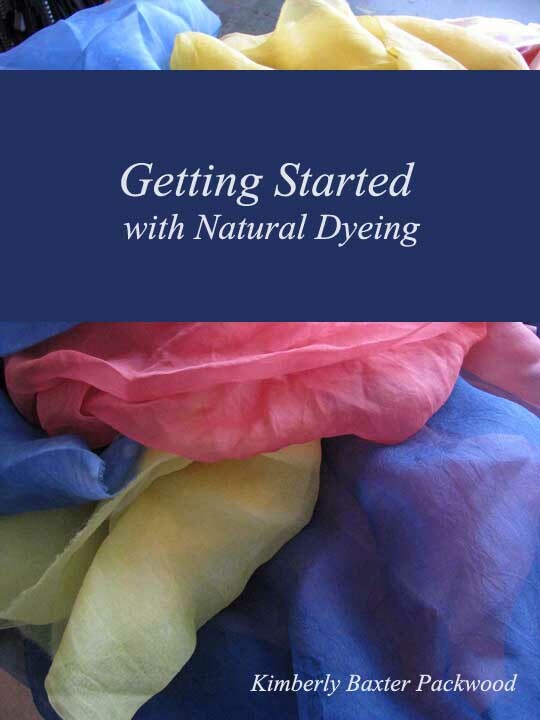 This book covers the very basics of what a Dyer needs to do BEFORE dyeing fabrics with natural dyes! If you own the other three books this information is covered in those books.